For the original post, click this link. The lack of color signifies purity and innocence. The novice has no knowledge of tae kwon do. The color of the rising sun. Seeds in the ground begin to germinate and grow. Basic tae kwon do techniques begin to be learned. The color of growing things that all can see. Power begins to develop. The color of the sky which growing things reach for. Physical and mental power starts to stabilize. The color of the ground where growing things are rooted firmly. Stability of physical and mental power is apparent. The color of blood, the essential life force. Maturity, honor and respect are exhibited as character begins to perfect. Black is the combination of all color. The final stage where technique is mastered within the humble and serene beauty of the plant. Thus, having explained the non-belted and white belts, we are now at the Yellow rank. The Rank 2 backpacker begins his journey at home. He has had his first taste of traveling abroad, and years later, sitting at his desk, his mind cannot help but drift back to that summer in Europe. The Yellow belt wants to do a real trip, something that doesn't involve rushing around quickly from city to city every day. He wants something exotic, something different. 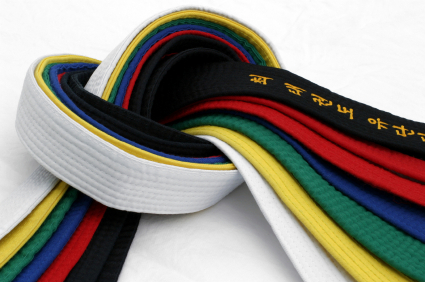 Eventually the yellow belt settles on a 3-month trip away to either Austrialia and New Zealand or Southeast Asia. These are far-away places, with amazing beaches, lots of partying, and tons of activities. It is real adventure! The Rank 2 lands in Bangkok (or Sydney) and feels alive again. 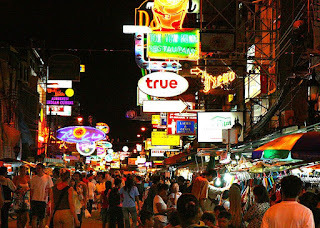 He rushes off to the closest backpacker ghetto on Kho San road and is thrilled to see lots of other backpackers just like himself. He is with his own tribe again. The rank 2 backpacker quickly strikes up conversations with Brits, Canadians, Aussies, Kiwis. Talk is easy. Every conservation begins with: "Oy, where you from mate?" "Where have you been on this trip?" And that's enough to start a dozen friendships a day. People love talking about where they've been and swapping stories. The Yellow Belt is in backpacker nirvana, hearing stories of adventure that he will soon get to have for himself. The rank 2 backpacker quickly gets to the first rule of budget traveling: marking yourself as a backpacker adept. 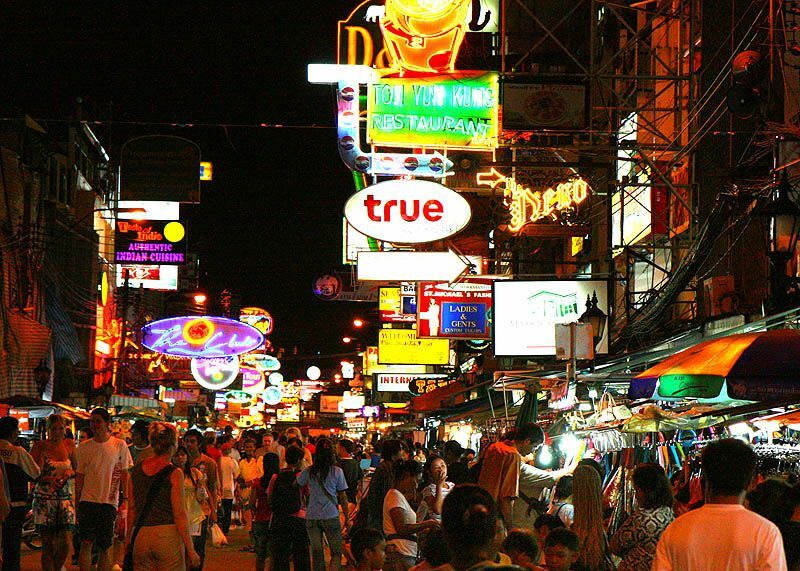 This means walking around the city's local backpacker ghetto and purchasing a few rings, amulets, and cloth bracelets. Cheap earth-toned indian-style clothing is a must. Capris, a sure sign you live in West Hollywood back home, are fine for guys in Bangkok if they look like you bargained them down to $5. Its also important to have good backpacking hair. The best thing to do is to grow out your hair a bit and then do something weird to it that would make you look really stupid at home. For instance, a classic move for guys is the native wolf-tail look, where the hair in the front is pulled into a high bob at the back of the head. When you are backpacking, this ridiculous look quickly attracts friendly smiles from patchouli wearing girls. But the more ridiculous the better. 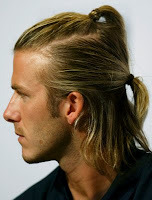 I once met a guy in Chang Mai with a curly afro who pulled it back with a big hair clip so that half the fro was squashed and half spouted out the back. It looked like he'd been attacked by a rabid bat. The women loved him. The yellow belt wants exotic adventure, and he knows the best place to find something off the beaten path is to read about it the Backpacker Bible called Lonely Planet. As he buries his nose into page 248, reading about the hill tribes of the north, he fails to notice his 12 new friends also buried in their identical Lonely Planets, also reading about the exact same hill tribes of the north. 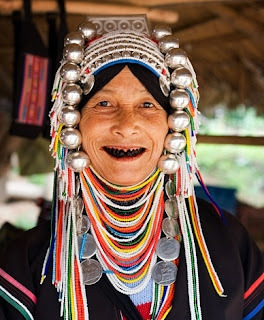 When he meets his buddies later at one of the many backpacker watering holes on Kho San, he excitedly tells his new mates of his plans to visit these tribes. He is surprised and delighted that they also know of these tribes, and they all make plans to take the same train up there and party all the way!! When they arrive at the village, they are greeted in a traditional ceremony. The tribal people do a dance, provide some food, and the Yellow Belt drinks some beers and snaps happily away. After he leaves, he is blissfully unaware that the tribe is busy putting back on their jeans and T-shirts, so that they can turn on the cable TV and rest up before the next group arrives in 2 hours. After all, he has some great pics of something truly exotic. The yellow belt travels from place to place in southeast asia, always enjoying the company of 10-15 other english-speaking backpackers in their 20's. There is always lots of partying and story telling. And there are just enough safe activities and day-trips that feel just different enough to placate his sense for adventure. At the end of this 3-month trip, the Yellow Belt is satisfied with his grand adventure. He tells his friends back home about how he was able to pet tame Tigers at a monastary, how he ate fried cockroaches at 4am, and how that one Kiwi girl was a mad nutter that outdrank him by 6 pints every night. He did something that most Americans will never do, he had a real adventure in a foreign land, and he has his name tattoo'ed in Thai on his back to prove it.